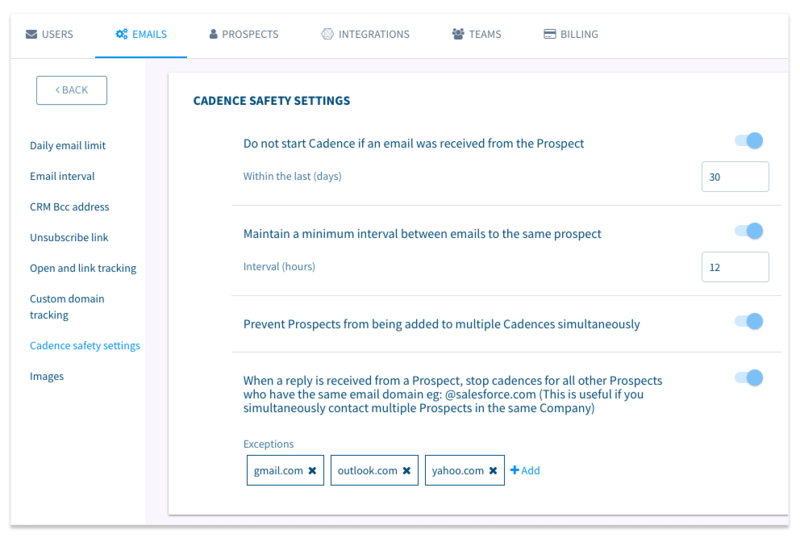 There are configurable Safety settings that help prevent accidentally sending too many emails to a prospect. There are configurable Safety settings that help prevent accidentally sending too many emails to a prospect. Each setting has a default value that you can modify/disable when required. Emails that Klenty stops from sending due to these configurations will be set as Flagged. You can find such emails in the Outbox and overrule individually if you don’t want to effect a change for all your prospects. This setting is available so you don’t send consecutive emails to prospects who you have previously talked to. You can disable this option or change the value (number of days) to suit your requirement. The default value of 12 ensures that you don’t send multiple emails to a prospect within a 12-hour window. You can change this value if you want a larger or smaller window, and you can also disable this setting if you do not want Klenty to stop such emails. This setting ensures you don’t accidentally add the same prospect to multiple cadences, however, you can turn it off if needed. When enabled, Klenty will stop follow up emails for prospects from the same domain, if one of the prospects replies.